A recent wildlife census tallied about 100 Bald Eagles between Croton Point Park and the Bear Mountain Bridge. Last week’s EagleFest drew thousands of spectators. There is a strong interest in eagles. However, the typical man-on-the-street can’t imagine eagles in Westchester. They envision eagles in the remote areas of the Rocky Mountains, not 40 miles from NYC. How Much Do you know about Bald Eagles? Bird Watcher’s Digest magazine created the following short multiple-choice quiz about Bald Eagles. See how much you know. 1 Bald Eagles, once on the endangered list, are found only in North America. 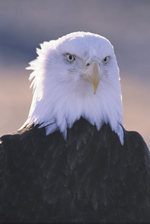 How many bald eagles are estimated to reside in North America? 2. How much does a typical adult bald eagle weigh? 3. How many eagle species occur in North America?